It’s no wonder that Australian English has its own character. Since the influx of British settlers began in around 1788, European Australians have dealt with relative isolation and the need to describe a very different world to their original homeland. Australians have also had a variety of language influences including Aboriginal and surrounding Asian contribution. In the last century, Australia has wrestled with questions about its own character and independence. All these factors have influenced modern Australian English and helped craft its unique vocabulary and accent. It’s now thought that the foundation of the Australian language character was already established as early as 1830. Since the first 11 boats brought convicts and naval officers from Britain in 1788, the early colony faced many travails and already established relations with the native Aboriginal population by this date. Early trading partners came from both southern Africa and Indonesia but the colony was essentially very isolated in the early 1800’s. Co-operation and communication were essential to survival, which may explain how the early language habits were established and promulgated in an independent and co-dependent society. From this isolated and challenging period emerged some of the characteristics that may have laid the cultural foundations for the modern Australian character. Egalitarianism, and valuing people for the work they can do and their efforts to survive in a tough environment, emerged strongly as values. Dialect words that the settlers brought with them from places such as the Midlands seem to have been retained in Australian English though they have largely disappeared from native Britain. These include words such as ‘battler’, used to describe a person that manages to support themselves in a challenging situation, or ‘bludger’, used to describe someone that lives off the efforts of others. In the 20th-century Australian society wrestled with its identity. For the first half of the 1900’s the population seemed to identify strongly with Britain and British values including class snobbery. Elocution lessons were popular, as Australians tried to change their speech to sound more British and less Australian. There was something of a class divide between those who spoke ‘Cultivated Australian’, a form of received pronunciation based on the variety of British English valued at the time, and those who spoke the common version of Australian English including all its vernaculars and unique pronunciations. By the 1950’s, people tended to aspire less to sounding British and it became more socially acceptable to sound Australian. 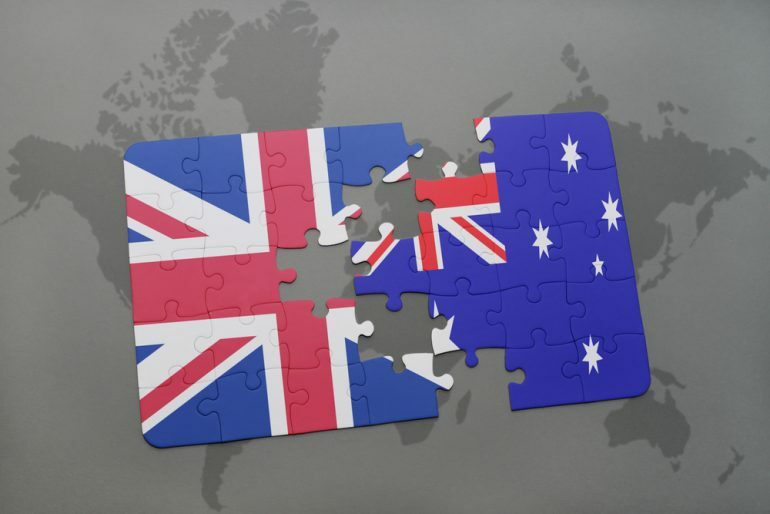 There eventually emerged a more common agreement on Australian English, sometimes known as General Australian. Australianisms such as dialect words and local slang is now much more acceptable in mainstream use, including at parliamentary level. The first boats included French, American and African convicts; later free settlers included some Irish, German and Italian migrants. After 1851 the Gold Rush brought new influxes that included Scottish and Chinese adventurers. Perhaps the most significant influencers on Australian English is that of the Aboriginal and Torres Strait Islander languages. At the point of white settlement, it’s thought there were around 250 indigenous languages across the Australian continent. Many linguists believe that it’s from some of these languages that Australia draws its key characteristics. For example, it’s thought that the upwards inflection at the end of sentences, which is considered to be especially Australian, is probably the result of Aboriginal language influence. 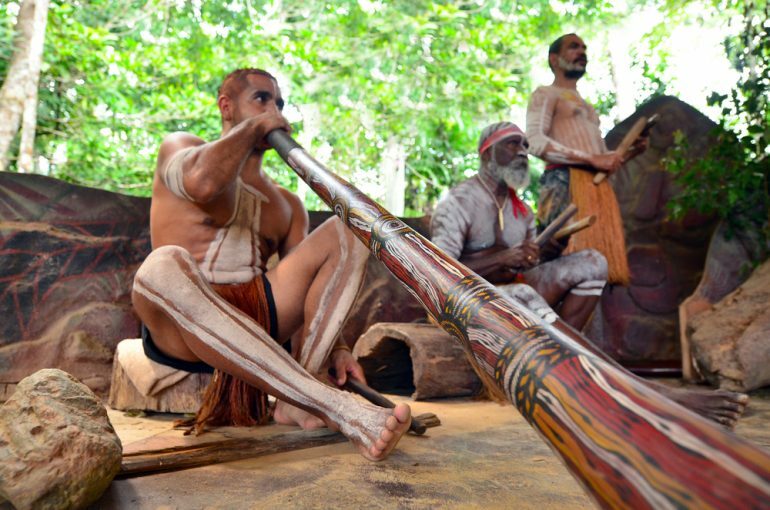 Yirrganydji Aboriginal men play Aboriginal music on didgeridoo and wooden instrument during Aboriginal culture show in Queensland, Australia. Other characteristics of modern Australian English that probably have Aboriginal language influence include the use of complex diphthongs and the nasal drone pronunciation. Aboriginal languages have contributed to the vocabulary of Australian English, as well as to place names. Words including ‘lingo’ come from indigenous people. Aboriginal words have particularly influenced descriptions of flora and fauna; words such as ‘kangaroo’, ‘wallaby’ and ‘dingo’ are all thought to be indigenous. It’s thought that modern Australian English has around 500 words of indigenous origin – these are probably from multiple Aboriginal languages. There are many places that bear indigenous names, including the settlements Woolloomooloo, Boolading, Jindalee, the Carbunup river and the Beerwah mountain. Australian English borrows not just words but also concepts from indigenous populations. Concepts such as dreamtime – Aboriginal spiritual beliefs about the foundation of existence – and Sorry Business – rituals and cultural practices surrounding a death in the family. Australian English can be hard to predict. Many English visitors have been perplexed by the habit of calling flip flops ‘thongs’. Australian English can be highly informal but it isn’t always predictably so. Swimwear is known by the rather Edwardian term ‘bathers’, and sweet peppers are known by the Latin ‘capsicum’. It’s all part of the unique character of Australian English, which draws from a wide range of influences. It’s probably fair to say that Australia is increasingly independent of Britain and increasingly open to new influences, particularly from Asian partners. The country only shed the final vestiges of British legislative power in 1986 and continues to debate the issue of retaining the British monarch as head of state or becoming a republic. Other debates include the question of relations with China, particularly Chinese political influence in Australia. It seems the question of Australian allegiance is an ongoing one. It will be interesting to see how the language evolves further as the country continues to debate these kinds of questions and accept outside influence.